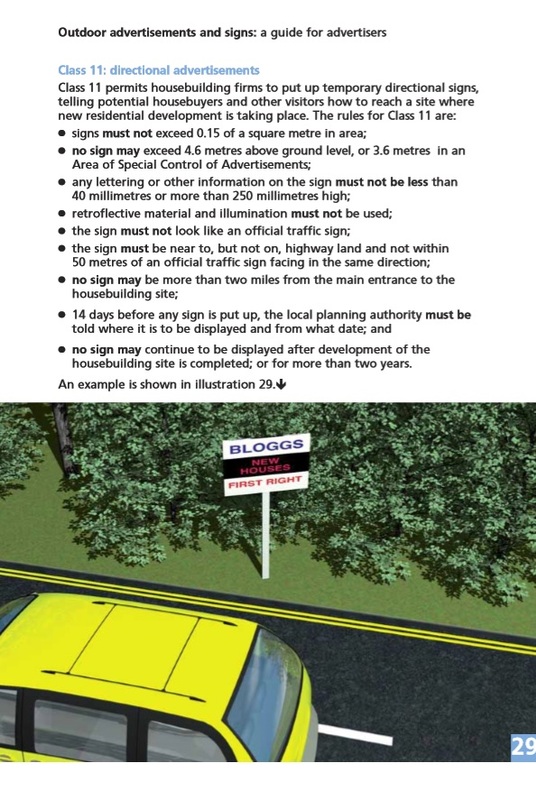 Many of the County Councils adopt the following practice for approving the yellow signs for new housing developments and it is on the basis and understanding that the signs are temporary to direct contractors or potential buyers. The development must have a minimum of 30 bedrooms on site (10 x 3 bedroom houses or 6 x 5 bedrooms). All development direction signs must comply with the requirements of diagram 2701 or diagram 2701.1 in the seventh schedule to The Traffic Signs Regulations and General Directions 2002. The maximum “x” height for the sign legend is 50mm and at least 2.1 metres headroom must be left below any signs that overhang a footpath. Only the name of the development site is permitted on the sign – not the builder or developer name. Sign locations should be limited to local area only, from nearest A or B road (depending on location and complexity of road network), with no more than two strategic road junctions. This can be subject to negotiations depending on the size of the development and potential impact on the road network. The house builder is responsible for the manufacture, installation, maintenance and removal (and all costs involved) of all such signs. County Councils require that the applicants hold a minimum of £10million public liability insurance in respect for works being carried out on the highway. Signs may be erected only when works begins on the site substructures and must be removed within three months of the sale of 80% of the development or within 6 months of completion of construction, whichever is sooner. No signs should impede the visibility of another sign on the highway or that of drivers. It is the applicant’s responsibility to gain permission from the Highways Agency for signs erected on any trunk roads. It is the applicant’s responsibility to gain permission from the electricity board to erect any signs on lamp columns with the correct fixings. The authorisation of temporary development signing is done on a case by case basis and records of their approval should be held on file. The purpose of these signs is to aid the navigation of construction traffic as well as potential buyers. County Councils work with District and Boroughs to remove non-approved signing from their highway network. Development signing is also inspected as part of the ‘highway asset’ on cyclical inspections by the County Council Highway Inspectors. The authorisation of house builder’s directional signage has never been subject to any charge, however it is something that is being looked at by councils at the moment. If you know of any house builder’s directional signage that does not comply with the above guidance rules, please inform your local County Highways Department. They would also be interested in the location of any old signs so they can check for authorisation and arrange for removal.